Pack the 4th (Fri) with family-friendly diversions at Lotte World. Next up on the itinerary: step into the grandiose world of Gyeongbokgung Palace, take some stellar pictures from N Seoul Tower, take an in-depth tour of National Museum of Korea, and get to know the fascinating history of Cheonggyecheon Stream. For more things to do, maps, traveler tips, and tourist information, go to the Seoul road trip planning tool . Reykjavik, Iceland to Seoul is an approximately 18.5-hour flight. The time zone difference moving from Greenwich Mean Time (GMT) to Korea Standard Time (KST) is 9 hours. Traveling from Reykjavik in January, Seoul is a bit cooler at night with lows of -7°C. Finish your sightseeing early on the 5th (Sat) so you can travel to Jeju. You'll explore the less-touristy side of things at Seongsan Ilchulbong and Udo. Next up on the itinerary: take in the awesome beauty at Halla Mountain, take in the spiritual surroundings of Gwaneumsa Temple, Head underground at Manjanggul Cave, and hike along Jeju Olle Trail Routes. 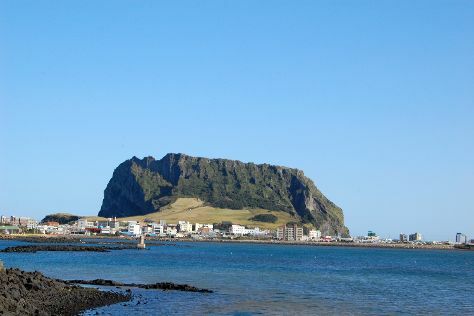 For photos, other places to visit, reviews, and tourist information, go to the Jeju trip itinerary maker site . You can fly from Seoul to Jeju in 3.5 hours. Alternatively, you can do a combination of car and ferry; or do a combination of train, taxi, and ferry. Wrap up your sightseeing on the 9th (Wed) early enough to travel to Busan. Kick off your visit on the 10th (Thu): kick back and relax at Gwangalli Beach and then tour the pleasant surroundings at Haeundae Beach. For traveler tips, maps, other places to visit, and other tourist information, read our Busan trip website . You can fly from Jeju to Busan in 3 hours. Other options are to do a combination of ferry and car; or do a combination of ferry and bus. 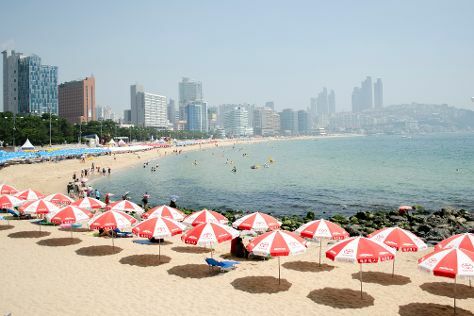 In January, daily temperatures in Busan can reach 7°C, while at night they dip to -3°C. Finish your sightseeing early on the 10th (Thu) so you can travel to Nagasaki. On the 11th (Fri), take in the views from Megane Bridge, take your sightseeing to a higher altitude at Mt. Inasa, then contemplate the long history of Nagasaki Peace Park, and finally get engrossed in the history at Nagasaki Atomic Bomb Museum. Here are some ideas for day two: head off the coast to Hashima Island, then take in nature's colorful creations at Glover Garden, and then examine the collection at Dejima. To find other places to visit, more things to do, ratings, and tourist information, use the Nagasaki trip itinerary maker website . Do a combination of ferry and car from Busan to Nagasaki in 5 hours. Alternatively, you can do a combination of flight and train; or do a combination of ferry and train. In January, Nagasaki is somewhat warmer than Busan - with highs of 11°C and lows of 4°C. Wrap up your sightseeing on the 12th (Sat) to allow time to travel to Ishigaki. Eschew the tourist crowds and head to Cape Hirakubozaki and Ishigaki Port Ritoh Terminal. Explore the numerous day-trip ideas around Ishigaki: Canyoning & Rappelling Tours (in Iriomote-jima) and Hateruma-jima (Cape Takanazaki & Nishihama Beach). 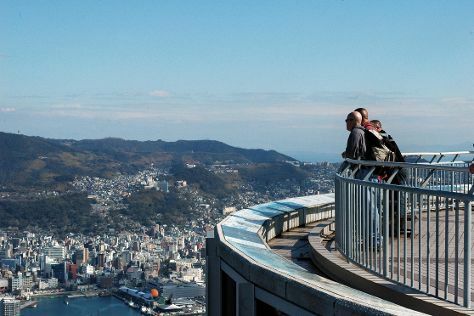 There's much more to do: enjoy breathtaking views from Tamatorizaki Observatory, kick back and relax at Kaiji Beach, make a trip to Nagomi Tower, and stroll through Yonehara Beach. For ratings, where to stay, other places to visit, and tourist information, use the Ishigaki trip planner . Do a combination of train and flight from Nagasaki to Ishigaki in 6 hours. Alternatively, you can fly. Expect somewhat warmer weather when traveling from Nagasaki in January: highs in Ishigaki hover around 24°C, while lows dip to 19°C. Wrap up your sightseeing on the 17th (Thu) to allow time to travel to Kyoto. Change things up with these side-trips from Kyoto: Nara (Todai-ji Temple & Nara Park). The adventure continues: steep yourself in history at Fushimi Inari-taisha Shrine, contemplate in the serene atmosphere at Kinkaku-ji, meet the residents at Osaka Aquarium Kaiyukan, and explore the historical opulence of Osaka Castle. To find reviews, photos, other places to visit, and more tourist information, read Kyoto travel route tool . Do a combination of flight and train from Ishigaki to Kyoto in 5.5 hours. Alternatively, you can do a combination of flight and train. Prepare for much colder weather when traveling from Ishigaki in January: high temperatures in Kyoto hover around 10°C and lows are around 1°C. Wrap up your sightseeing on the 23rd (Wed) to allow time to travel to Tokyo. Have a day of magic on the 28th (Mon) at Tokyo Disneyland. There's still lots to do: don't miss a visit to Meiji Jingu Shrine, admire the natural beauty at Shinjuku Gyoen National Garden, contemplate in the serene atmosphere at Senso-ji Temple, and get a sense of history and politics at Imperial Palace. To see where to stay, ratings, reviews, and tourist information, you can read our Tokyo trip site . You can take a train from Kyoto to Tokyo in 3 hours. Other options are to do a combination of bus and flight; or drive. January in Tokyo sees daily highs of 11°C and lows of 1°C at night. Wrap up your sightseeing on the 29th (Tue) early enough to travel to Queenstown. Step off the beaten path and head to River Rafting & Tubing and Queenstown Hill. Change things up with a short trip to Milford Sound in Te Anau (about 1h 50 min away). 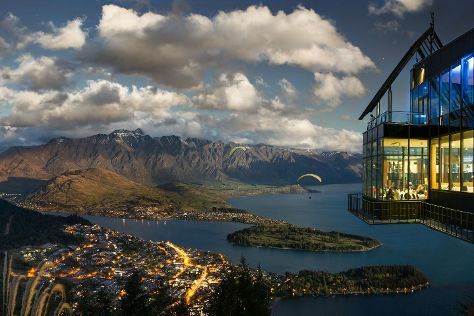 There's still lots to do: get your game on at Skyline Queenstown, race across the water with a speed boat tour, take the plunge with a skydiving experience, and get interesting insight from Tours. For maps, where to stay, photos, and tourist information, go to the Queenstown online journey planner . Traveling by flight from Tokyo to Queenstown takes 16.5 hours. Alternatively, you can do a combination of flight and bus. Traveling from Tokyo to Queenstown, you'll lose 3 hours due to the time zone difference. Cap off your sightseeing on the 5th (Tue) early enough to travel to Christchurch. You'll explore the less-touristy side of things at Dolphin & Whale Watching and Swim with Dolphins. Change things up with these side-trips from Christchurch: Akaroa (The Garden at French Farm, Orion Powerhouse Gallery, & more) and Little River Gallery (in Little River). There's much more to do: admire the natural beauty at Christchurch Botanic Gardens, don't miss a visit to Cardboard Cathedral, tour the pleasant surroundings at Hagley Park, and examine the collection at Quake City. For ratings, maps, photos, and more tourist information, read our Christchurch trip itinerary planner . You can fly from Queenstown to Christchurch in 3 hours. Alternatively, you can drive; or take a bus. In February, daytime highs in Christchurch are 26°C, while nighttime lows are 13°C. Cap off your sightseeing on the 11th (Mon) early enough to travel to Wellington. You'll explore the less-touristy side of things at Wine Tours & Tastings and Omaka Aviation Heritage Centre. Step out of Wellington to go to Picton and see Queen Charlotte Track, which is approximately 1h 25 min away. There's still lots to do: see the interesting displays at Museum of New Zealand (Te Papa Tongarewa), look for all kinds of wild species at ZEALANDIA Sanctuary, get a sense of history and politics at Parliament Buildings, and get engrossed in the history at Wellington Museum. To find where to stay, ratings, traveler tips, and more tourist information, refer to the Wellington trip planning app . You can fly from Christchurch to Wellington in 3 hours. Other options are to do a combination of car and ferry; or do a combination of train and ferry. Plan for somewhat warmer nights when traveling from Christchurch in February since evenings lows in Wellington dip to 17°C. Finish up your sightseeing early on the 17th (Sun) so you can travel to Rotorua. Explore hidden gems such as Horseback Riding Tours and Orakei Korako Cave & Thermal Park. Explore the numerous day-trip ideas around Rotorua: Mt Maunganui Main Beach (in Mount Maunganui), Taupo (Aratiatia Rapids & Huka Falls tracks) and Waiotapu Boardwalk/ Mud Pool (in Wai-O-Tapu). Next up on the itinerary: witness a stunning natural landmark at Wai-O-Tapu Thermal Wonderland, admire the natural beauty at Government Gardens, let the river carry you with a rafting and tubing tour, and relax in the rural setting at Agrodome. To see maps, ratings, and other tourist information, go to the Rotorua trip planner . You can fly from Wellington to Rotorua in 3 hours. Alternatively, you can do a combination of flight and bus; or drive. February in Rotorua sees daily highs of 28°C and lows of 19°C at night. Wrap up your sightseeing on the 24th (Sun) to allow time to drive to Auckland Central. Discover out-of-the-way places like The Lost Spring and Waiheke Island. There's still lots to do: take in panoramic vistas at Sky Tower, learn about all things military at Auckland Museum, explore the world behind art at Auckland Art Gallery Toi o Tamaki, and step off the mainland to explore Tiritiri Matangi Island. To see maps, other places to visit, and more tourist information, read our Auckland Central trip itinerary website . You can drive from Rotorua to Auckland Central in 3 hours. Other options are to fly; or take a bus. Traveling from Rotorua in February, you can expect nighttime temperatures to be a bit warmer in Auckland Central, with lows of 26°C. Finish up your sightseeing early on the 28th (Thu) so you can travel back home.